Shorter Length Blade for Indoor Use. With a standard length, double pegged 10.5" tsuka (handle) and a 21" blade forged from the same revolutionary 9260 spring steel as the Cheness Cutlery Heavy Duty Dojo Cutters, this eminently durable shortsword is designed as the perfect compliment to the extremely popular Tenchi Katana. Featuring the same distinctive solid brass 'Miyamoto Musashi' Double C-Ring tsuba hand guard, this mean looking sword makes an incredibly tough cutter in its own right. For a closer look, see the full review here on SBG. Monotempered 9260 Spring Steel sharpened blade. Cotton ito wrap over authentic rayskin handle. Brass Fittings. We guarantee if you keep it well oiled and maintained, the blade of any sword sold from the SBG sword store will hold up to a LIFETIME of reasonable usage without breakage. If it breaks during the course of reasonable and intended usage we will replace it with either the same (or if unavailable, a similar) model completely free of charge. If you abuse it, like try to cut down a tree, attempt to replicate the destructive testing vids on you tube or otherwise use it in any way outside of traditional cutting techniques, we will do our best to help but the warranty is void. This warranty applies to the original purchaser (proof of purchase required) and remains in effect for as long as SBG is around to honor it. I bought this along with the Tenchi Katana. The Katana was pretty good and really had no serious issues. 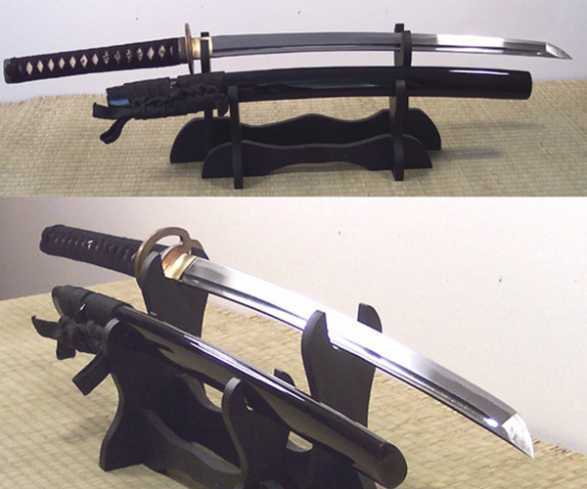 The Ko Katana had some issues that I was able to take care of but not everyone would know how to do these repairs. First issue was the Tsuka (handle) was extremely tight and obviously hammered on. Had two cracks running in about a half an inch. The Fuchi (handle collar) is pretty thin and cheap so I didn't trust it to contain the cracks under use. Glued the wood cracks and epoxied the collar onto the handle. Not like I'm ever going to remove the Ito (braid) anyway. The next issue was taking care of the handle fit to the Nakago (tang). A little careful filing and I got the fit pretty well. The biggest issue was the fit of the Saya (scabbard). It was extremely loose and did not hold the sword much at all. I had some wood veneer (birch?) and had to put some at the top and bottom of the Koiguchi (scabbard mouth) and even some on each side before I got it to be tight. Some very careful filing with some jewelers files and I got it where I wanted it. Fairly snug but not too tight. This blade and the Katana blade were somewhat sharp but running them on the leather strop on my belt sander with green compound brought them to where I wanted them. The blades on these swords are not polished very well and for the price you wouldn't expect it to be. I was ambitious on this blade and wet sanded it with 400, 600, 800, 1000, and 1500 grit paper and it looks a lot better than how it came. Haven't done the Katana yet, but I will. Overall these are good blades for the price. Just don't expect it to be perfect or pretty. The wrap is tight, but it is cotton. 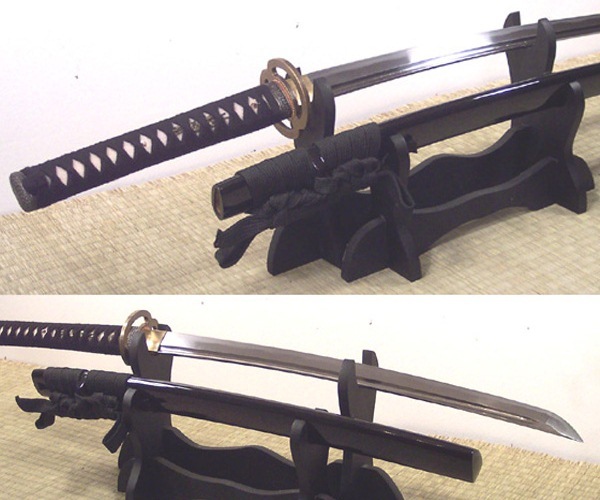 The Tsuba (guard) is a nice piece of brass, but the rest of the fittings are cheap and thin. They work for a beater use sword. You may have to do some maintenance on these or you may end up sending them back. Google the fixes on YouTube and it is nothing complicated. Overall I think they are good for the price and the little bit of repair work I did and I'm pretty happy with them. Our responseGood to see you taking the swords to the next level - we have a lot of DIY tutorials on the various fixes and modifications you did on our main site. We also have an article about Tight and Loose Saya Fixes which explains the most common causes of ill fitting saya and what to do about it..